Online Trademark Application with Canadian Intellectual Property Office: Online application complete with instructions. A thorough read of the instructions highly recommended. 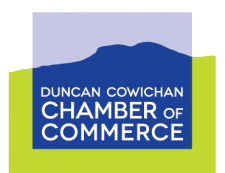 Cowichan Business Roundtables, Summary Report Apr. 2017: Between November 2016 and January 2017, a series of six Roundtable Consultations were held at the Community Futures Cowichan in Duncan. Business leaders from six industry sectors shared information they felt could would the business climate in Cowichan. Financial Templates & More Business Resources from Community Futures Cowichan: Community Futures is BC's most important small business development organization. They offer a variety of services and tools to help entrepreneurs and small businesses achieve their goals. Services including business support services, planning advice, and loans. Compared with other traditional source financing options, the businesses of Community Futures’ clients grow faster and last longer. Live Work Invest, 7 Reasons to Make Your Home in Cowichan: An overview of lifestyle and business in the Cowichan Valley Regional District. BC Chamber Collective Perspective Survey Nov. 2016: The BC Chamber’s province-wide survey discovered a strong confidence among the business community in both the current health of their businesses and their future outlook on the economy. Facebook & Instagram: Are Two Better than One? How to improve your Facebook Business Page reach by using Instagram, with an overview of the new Instragram Business page. From Brenda Burch of Social Media is Simple. Presented at the 2016 Business Showcase. Business Leaders Survey Results - January 2016: The Chamber partnered with MNP and Community Futures Cowichan to survey business leaders regarding hiring intentions, growth expectations, challenges and opinions on local issues. Google Guide for Small Business: The Google My Business Guide brings together all of the ways Google can help your business shine in one, easy-to-use location. Includes: Edit, Share & Engage from a single dashboard, Go mobile, Stay on Top of Reviews, and Analytics. CPABC recently published a series of economic overviews of BC according to the provincial 8 development regions. The Vancouver Island & South Coast Report is here. All reports are available here. The Cowichan Valley Regional District recently released Community Profiles for each of the communities that make up our area. These profiles include: demographics, education, health care, recreation, transportation, culture and more - all aspects new and existing businesses, and individuals will find useful. BizPaL is an online service that provides businesses with simplified access to information about business permits, licences and other requirements. BizPaL generates a list of permits and licences from participating levels of government, along with some supporting information. Though every effort is made to ensure BizPal is current & accurate, it remains the applicant's responsibility to obtain required permits and licences. Gary Herman, CEO of the Industry Training Authority presented in Cowichan on Mar. 5/15 with an overview of training and opportunities in the burgeoning Trades sector.Mr. Herman's presentation is available online here. This new tool is designed to assist Island businesses tap into the opportunities created by the Liquefied Natural Gas industry as well as other major projects on Vancouver Island and/or throughout B.C.